January 2015 TargetPoint – What Is My Motive? A couple of months ago I made a commitment to my OTI men’s group here in Colorado Springs that I was going to get up every day at 5:00 AM from now on in order to spend 2-3 hours with the Lord. This decision was born out of a conviction that, while I find it easy to speak on the subject of having an intimate relationship with God, I was not experiencing personally the intimacy I truly desired. I am pleased to report that my track record here has been pretty good. I am truly experiencing His presence in ways I never imagined. However, a couple of weeks ago as I was praying I asked God a question. Lord, am I becoming the man you intended? As most of you know, this is the mantra for OTI. Our ultimate goal is to become the man God intended. The short answer from God to me was NO. I am truly experiencing His presence in ways I never imagined. Now I knew that had to be God—there is no way I would have said that to myself. What He went on to impress to me has to do with a challenge in the area of humility and selflessness. I sensed that He was affirming and even pleased with my decisions and actions to get closer to Him but He was also letting me know that I really needed to focus on these areas. Two areas I, and many men, struggle with. For me this was a major spiritual shot across the bow—I cannot continue to contribute to the hypocrisy that would allow me to teach on something I myself do not have under control. The Bible teaches us to consider others better than ourselves and to not think of ourselves more highly than we ought. As easy as it may be for those words to roll off our lips it is very difficult to live them. We have been raised in a culture that actually honors the opposite. It was at this moment that I remembered a quote from an old book by Dr Larry Crabb titled The Marriage Builder. To this day I believe this is one of the best books on marriage I have ever read. In the book Larry Crabb says, (I am paraphrasing here) in all human interaction we are doing one of two things…we are either ministering or manipulating. We are either interested in truly serving with no self-interest in mind—or—attempting to get something for ourselves. I remember reading that and thinking, come on—it can’t be that simple. The more I thought about it the more convinced I became that it really is that simple and it all goes to the heart and begs the big question WHAT IS MY MOTIVE? OK, now please tune in here because this is a huge idea. I am convinced that our ability to examine our motives in order to determine whether we are inclined toward ministry or manipulation is crucial to our witness for Jesus and the ultimate advancement of His kingdom. People know the difference. OK, now please tune in here because this is a huge idea. I am convinced that our ability to examine our motives in order to determine whether we are inclined toward ministry or manipulation is crucial to our witness for Jesus and the ultimate advancement of His kingdom. It was at this moment that I began to evaluate my motives for all that I could remember doing over the last couple of weeks. Whether it was simply relating to my wife, engaging in a meeting with someone, sending out an email or just planning anything, I asked the question, what was my motive? I was deeply convicted that my track record on the scale of ministry vs. manipulation was very poor. I remember a conversation I had recently with my friend Bill McCartney, founder of Promise Keepers, where he told me that everywhere he goes and speaks these days he is encouraging men that every day they need to be searched, fed and led. We need to ask God to search our hearts to make sure there is nothing in there by way of self-serving motivations, un-forgiveness or bitterness, etc. Then we need to be fed by His Word and led by the Holy Spirit. Every day. Now, I am making a commitment every day to ask God to search me—to help me be sure that in everything I do my motive is to serve and minister and not manipulate. On a very personal note—I have had numerous occasions to write to and meet with various people since this revelation. As I asked myself the question, what is my motive, I was challenged in many of these situations to literally change gears. Now, I am making a commitment every day to ask God to search me. 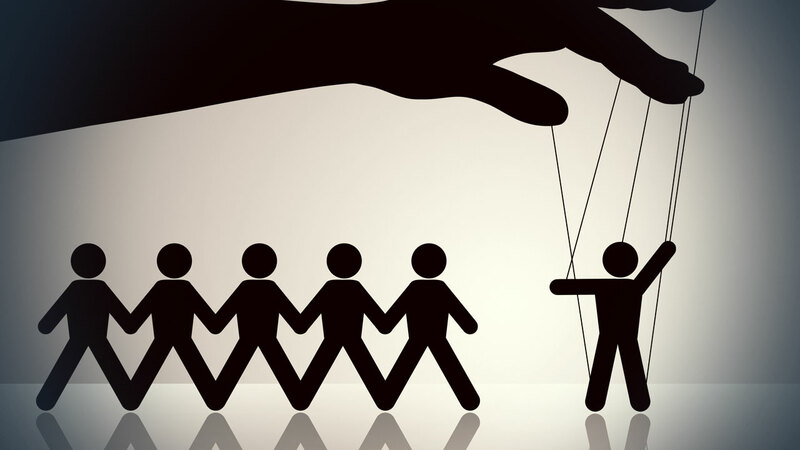 Most of my inclination toward manipulation is designed to be self-serving, I believe this is the case with so many Christians these days. I have found that every time I leave my agenda behind and truly just love and minister to those I encounter, it not only feels wonderful, but I find that God really shows up in ways I would never have imagined. Below is a picture of a little tool I ordered for myself that is helping me immensely. It is a simple bracelet that I wear every day—it never comes off. I look at it all the time and it challenges me throughout my normal daily routine to remember this important question. I have just ordered a bunch for the men here at OTI and would encourage you to consider getting one if this message resonates with you. You can order them on line yourself—they are very inexpensive, or I would be happy to mail one to you if you send me your address. Just email me at vince@otm.co. NOTE: The Lord also prompted me to change my message at OTI last week and deal with this subject—the message is Live-Streamed and archived. If you want to view the brief session click here and advance to about the 10-minute mark. I hope this message has blessed, but more importantly, challenged you. Can you imagine what it would be like if all of us asked this question before we engage others? Maybe we need to encourage men across North America to begin wearing these bracelets—remember the WWJD?